This tunic was (is?) 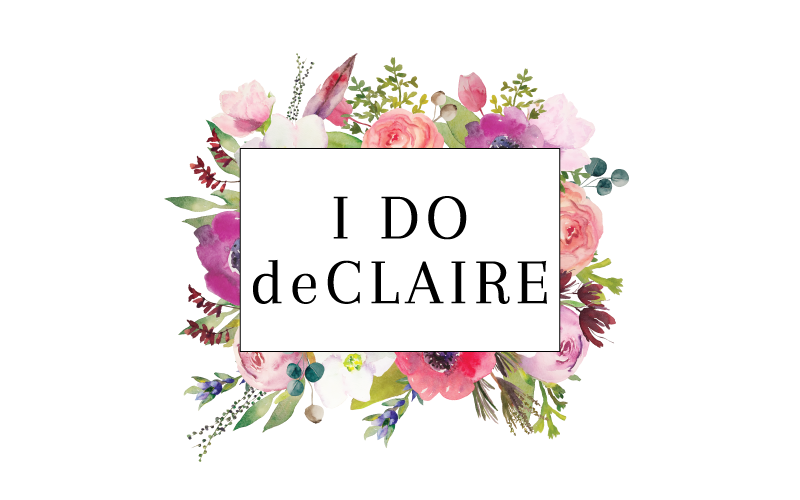 my all time favorite thredUP find (Until I snagged a pair of pink Tory Burch flats this past month! It's a good thing a girl can have quite a few favorites.). I was initially drawn to the print and detail on the wrists and neckline. When it arrived I was pleased to see the length looked good with shorts. You see, I am a huge supporter of long sleeves in summer. It's hard for me to have sleeveless shirts and shorts on. It isn't about too much skin showing, it's more about body temperature. I am that person that brings a jacket to the grocery store. And also taught her daughter to say, "Brrr! That's cold!" in the freezer section (totally justified). Having either my arms or my legs covered up is a must. That AC just gets too cold! So the end of my story is that I really love this top. It's lightweight for outside, but still gives me the coverage I need for inside. Perfection! 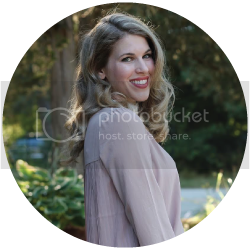 Check out my referral code for $10 off your first purchase at thredUP here. Yep, that's a great find for sure! I don't know why but I really love your hair like that. It looks great on you. Also, that top is gorg! love vineyard vines! This tunic's coloration and silhouette is perfect for you! Such a cute tunic, lady! That is a great tunic and it looks great with those white shorts. I've been trying to find a nice pair of white shorts all summer, but no luck! I can't wait to see those pink Tory Burch flats!! love the tunic! so beautiful!so summery! love your tunic! i am a big fan of them. ya look great. What a great ThredUp find! I bet those TB flats are awesome too. Oh and I have a pair of sandals just like yours that I love!! Totally loving this whole outfit. I completely agree, the freezer section of the grocery store needs like a down parka to make it through! 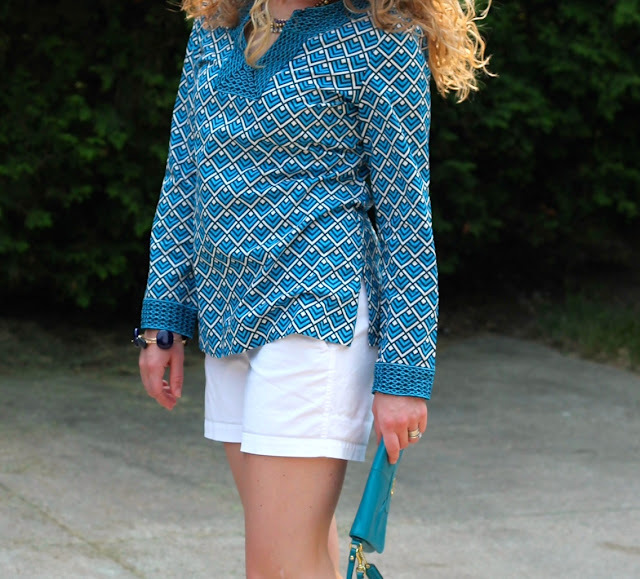 I love that tunic, and I love the idea of wearing long sleeves with shorts. I need to try that sometime! So Summer fresh and perfect!!! A great tunic, I can see why it was and is one of your favorite purchases. I am the same way with temps and always need to carry a jacket. That tunic is so cute! What a great find! I always am freezing and need to have my legs or arms covered too. 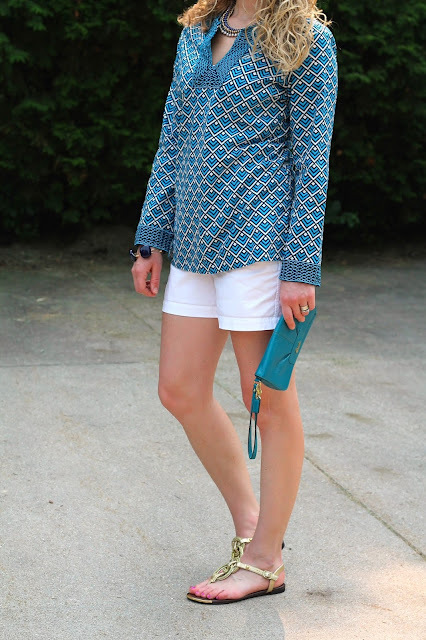 I love that tunic--what a great find! I'm the same way, always freezing to death inside in the summer. A lightweight long-sleeve top with shorts is the perfect combo! That tunic is so, so pretty! I love the blues and that clutch matches perfectly! Love that outfit! The sunglasses are really nice. Love your hair!!!! Turquoise is such a glorious colour for summer especially if the more citrus colours don't work for your complexion and metallics are just the perfect complimentary colour. And a stunning print too. I bear aircon either. There is never any happy medium with it! Love love LOVE the print on this tunic. And your curly hair! I love it! Great outfit on you! I totally get what you are saying about the long sleeves. I am wearing pants today! My work is always freezing. Love your tunic! What a pretty tunic! I love your hair curly like that! Your clutch is so pretty! I love that color! Gorgeous tunic - so summery and fun. Blue and white is my favorite. I am with you on the cold! Why do places have to crank the A/C in the summer. How funny your daughter says - Brrr! And, I take a jacket to the grocery store, too. Hi Laura, I always end up bringing a jacket or cardi to places that are chilly because of AC. Love your patterned blue top with the white.It looks so beachy and summery. Love it. I also love the waves in your hair, mine is poker straight! Hope to see you at Turning Heads Tuesday! Great look, Laura! I love a loose fitting long-sleeve blouse with shorts for the summer. The turquoise looks fab with the white shorts and I love the gold accents! Very luxe! What an awesome tunic! I love the bold print. Love the blue and white. 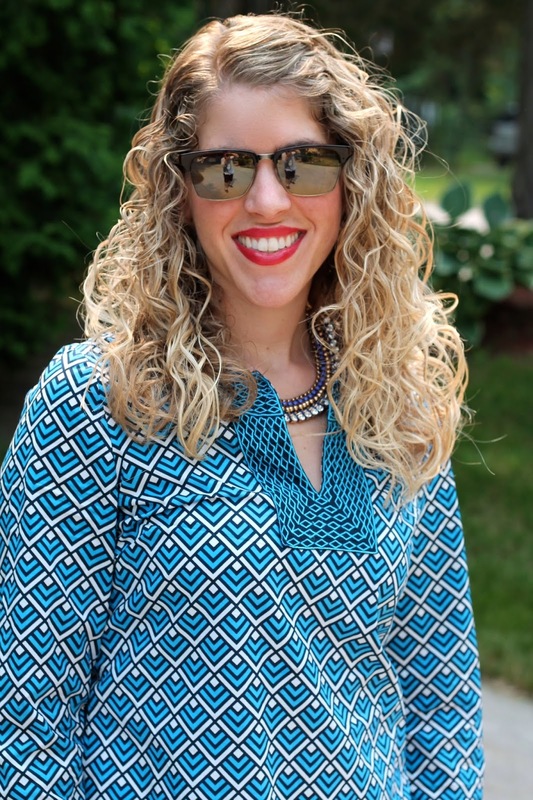 What a great finds at thredUP! 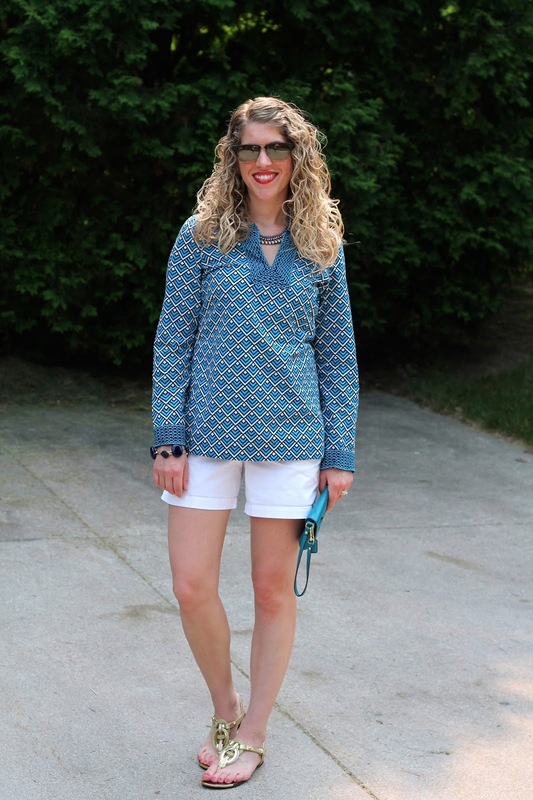 What a gorgeous tunic Laura :) No need to apologize about the long sleeves, I wear chambray long sleeved shirts in the summer ALL THE TIME! Thanks for hosting. Also, I'm slowly catching up on blogs, so I'm preapologizing for all the comments coming your way. Oh! And your new blog design looks really, really nice.